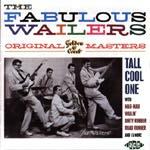 This CD collects many of the more significant Golden Crest session of the Wailers. Golden Crest was the label they hit with originally, and most of those sessions were instrumental. Afterwards, they were on Etiquette and Imperial, where they produced some totally punk masterworks like Out Of Our Tree. From this CD, you will hear the developing Pacific Northwest sound, the punk attitude that later bands like the Sonics exploited so well. Dirty Robber is here in both the single and album versions. Some of the instros here are issued for the first time, and the whole CD is the first issue from the original master tapes. Not only is this a very chunky and surfable track, but it is so percussive, it could probably be done with just an array of drums. Really tribal, and very rhythmic. While you might expect tribal thunder here, what you get is a "Tequila" like number. It's good, but doesn't quite sync with it's title. From 1964. A fast Link Wray-like number, in his less interesting fifties progression style. The track is overdubbed with echoed handclaps. Originally issued in 1959. Bobby Fuller & the Fanatics used to do "Shanghaied" and is has all the elements necessary for inclusion in a surf set, with just a little imagination. It's raw and garagy, and primal. The melody is playful, while the tone is ominous. Fake stereo delay detracts significantly from the original raw power of this track. The inevitable clone followup to a hit single, this is as close to "Tall Cool One" as you can get without being the same. It's pretty smooth, and more beat generation oriented. Fake stereo. An odd track for this band, being very MOR, and tame as they come. It features a vibrato guitar slowly letting out long shimmering notes, a piano delightfully plinking away, and a downright elevator sax. The "enhanced" stereo is dreadful. Pumpin' boogie piano and sax number, definitely party hipster cool. A "What'd I Say" kinda thing under a "Johnny B. Goode" sorta rhythm, but no melody. It's infectious. This is a mighty ominous and sad number. It's about being inside, walled off from freedom. There are sounds of escape, but primarily, this about captivity. Slow, melodramatic, and highly inventive. The Debonairs released a cover of "High Wall." A very Link-like tune, slow and eerie. This is based on the "Peter Gunn" rhythm, but doesn't really compare, either sonically or structurally. A grodie low down progression with a long sassy sax. A soul groove, featuring a sax and guitar harmony duet jam. Mid tempo fifties fare. This is a cool version, recorded in generally shallow and ambient stereo. The sound is not very clear, but the track is more raspy and edgy. Little Richard piano, pumping rhythms, progression dominated, and punctuated with shouts of "Snake Pit." Previously unreleased. This alternate version of "Driftwood" is previously unreleased for good cause. The sax is almost entirely missing from the mix. The vibrato guitar is fine, as is the piano. A fifties progression, almost like the backtrack to Dirty Robber, but tamed to a pale imitation.